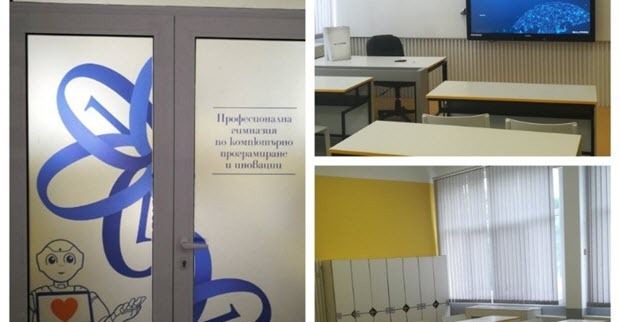 September 2018 – The first Bulgarian High School of Computer Programming and Innovation opened its doors on September 11, 2018, in Burgas. BULRPOS is one of the IT companies supporting this educational institution, which is one-of-a-kind in the country. The official opening ceremony gathered exited students, parents, representatives from the business and politicians. The High School of Computer Programming and Innovation is aimed at providing high quality education and preparing IT specialist in the field of computer science. It will work closely with some of the leading IT companies in order to maximize the potential of the students and teach them practical skills. By supporting the establishment and development of the high school, BULPROS goes one step further in making education its priority. One of the company’s main strategic goals is to support the educational system and the development of young IT talents through collaboration between the business and the institutions. Our colleagues, Valentin Bonev (Solution Architect at BULPROS) and Alexander Tzonev (CTO at BULPROS) were guest lecturers in the first week of school. They held two presentations to the students and shared their experience and know how on hot IT topics such as Internet of Things (IoT), Big Data and Artificial Intelligence (AI). “We are happy to support the school from its start as we have one shared goal: to give the children the opportunity to develop their IT talent and grow in an innovative and motivating environment. Moreover, the meetings with the students were very exciting and inspiring for us”, said Alexander Tzonev, CTO of BULPROS. It is a great honor for BULRPOS to meet the young talents at the High School of Computer Programming and Innovation and to be part of this initiative. We believe that the business needs to support the educational system and will continue to do our best to improve the quality of the education and offer better opportunities for the young professionals in Bulgaria.